Bubba, "Mommy, my stomach hurts." Me, "It does? What's wrong with it?" Bubba, "Jesus is jumping on it!" It took me a minute and then I realized...If Jesus is in your heart and he starts jumping, it probably would make your stomach hurt. EJ & I had to get our fingerprints done recently. No...we have not decided to live on the wrong side of the law. It was for a much better reason but that's for another post. To truly enjoy this story you must have a little history. I was a VERY accident prone child. I'm sure I caused Pop and Grammy plenty of stress through the years with my little mishaps. One of those occurred when I got the bright idea to stick my finger into a door jam during a rousing game of chase with some friends at our house. I was just a little thing and apparently believed that if you put your finger into a door jam and then yelled, "Ha Ha, now you can't shut the door! My finger is in here!" it would indeed keep the person from shutting the door on your finger. My glee quickly turned to pain when the door slammed and the end of my pinky got cut off. Before you go feeling all sorry for me. Check out my other pinky. They are just genetically stubby. Back to the fingerprints. These days they have a scanner that takes your prints and puts them directly into the computer. I watched EJ get his done with no problem. Then it was my turn. Everything was cool until they got to THE PINKY. The officer would roll my pinky and the computer would reject it. I thought to myself, "how many times should I let him re-try the print before I let him in on my pinky problem." I guess that old childhood injury finally came back to haunt me! Don't worry they did accept my partial pinky print. I've been given an incredible opportunity...to continue working for the folks in Charleston, SC...remotely...what a great idea! My alarm goes off (yes it's early and we don't have a rooster in the hen house at this point), I commute from the bedroom to the living room (routing through the bathroom and the kitchen) and I'm at work. It's a beautiful thing. My overall office is extensive and I'll show you more of it later but for now I'll show you my work space, here it is...all 20 cubit feet of it. The scenery is nice and getting better all the time as Pop and I continue to finish out our space. I'll put pics on showing the finished space soon...okay, as soon as I can since I don't know quite when it will be completed. which makes me think of another office I've seen...enjoy the following video clip (thanks for supplying it, Romeo)and stop by my office sometime - I'll make you a cup of coffee or tea. Hello all, I have taken some time to collect my thoughts from the jail that they have so unjustly put me in. Yes, this is Daisy the so called "dunder heed". How slanderous is that?!! I'm on a short leash these days...if you know what I mean. So between my naps (which are frequent) I have had a chance to create my defense to these trumped up charges. First, my accusers don't want to take me to trail for fear that they might lose because they have no witnesses. I know, I know Grammy would come to the stand first as the first "witness" however what has she really witnessed? NOTHING! She only saw me and my neighborly friend...we'll call him "Mr. Clucks" (names have been changed to protect the innocent) out on a nice "walk." We happened to be discussing the overpopulation of cattle in our area at the time. Second, ask the prosecutor if they have EVER found the body?!! NO, it's all circumstantial evidence. These cases are rarely won, again another reason they want to just put me in a "Gitmo" and let me age slowly. Lastly, it couldn't have been me because, as we all know, I have a bad leg. I believe that we have the documentation to prove this. How could I have done this crime? Here's my suspicions. I believe it was those crafty cats. Those things have been out to get me from the word go. I think that it was a conspiracy with Ranger as the leader! And I think that it's dangerous to be letting our kids be around such a crafty criminal. I mean, who really wants to have their kids around these hardened thugs? The first chicken that was hurt on our property was hurt at night before all the problems that we had that following day. Well, I'm kenneled at night so you know that it couldn't have been me. This supports my idea fully, along with common knowledge that cats "hunt" at night. Plus, have you seen the size of the rats that Ranger has killed? They're about the size of a small chicken! Coincidence? I think NOT! I have snuck into the house unnoticed to post this while the farmers weren't looking. I would like to use the comments under this to be my petition to free me from my en slavery! As you know, we live with Grammy and Pop. When you enter our home you have two options... go downstairs to their place or upstairs to ours. Both doors have locks on them. My boys have a new game. It's called "race Mommy up the stairs and then lock her out." The lock is tricky and they can get it to lock but can't manage to unlock it. (and they don't really want to anyway) So there I am...stuck. On the other side of the door are two pre-schoolers laughing victoriously. Lucky for me Grammy saves the day and brings me her key so I can get into my own house. It was funny...the first time. So I'm going to give out awards for the best and worst producers for the season. I know what you're going to say, we're not done with the season yet, but we're close enough that I'm pretty sure that I can place them where they're going to end up. So they kinda look alike. But our green beans are doing much better than our peas did. This is just the latest harvest of them...about 3 pounds worth, it took me about 45 minutes to get them all picked. Grammy even came and helped for about 10-15 minutes, and Farm Chick for about 5 minutes. Last week while I was picking some tomatoes I noticed that there were tons of buds on the green beans. I told Farm chick, there are going to be a huge bunch coming really soon. Sure enough, there was. It took me a whole hour to snap the ends off! Do you all remember the goddesses? 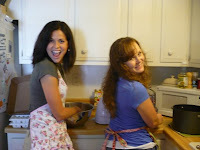 I was privileged to have 2 of them over on Sunday for lunch and then some salsa makin'. MK Lady got sick with the flu and couldn't make it and Big Red wasn't going to be in town. We forged ahead just the three of us and had a fantastic time! 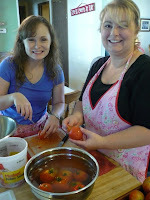 MI and Amos were lookin' good while they "put up" salsa. 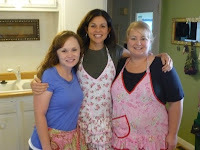 They humored me and put on aprons. I'm pretty sure you have to wear an apron to cook in my kitchen. Just seems like the right country thing to do. They made the process go quickly! 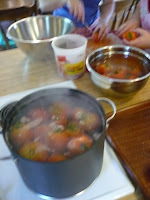 We sort of made an assembly line and whipped those tomatoes into shape. Our salsa turned out hot and spicy...just like us! Girls, I love ya! Come back to Four Sisters Farm very soon.